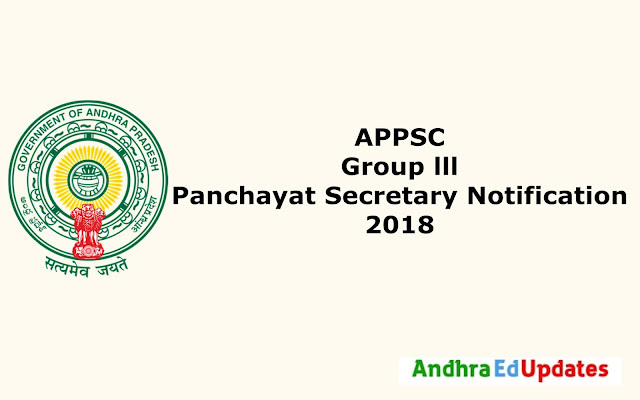 APPSC Panchayat Secretary 2018-19 Group 3 Notification - AndhraEdUpdates | APPSC Notifications, CET exams, etc. APPSC Panchayat Secretary Notification 2018: APPSC( Andhra Pradesh Public Service Commission) Notification for 1051 Group 3 Panchayat Secretary posts ha been released. The vacant posts are Panchayat Secretary posts. Aspirants wanting to get into AP Government jobs can apply for the APPSC Panchayat Secretary posts through the online portal at psc.ap.gov.in. Aspirants who have already generated their OTPR can register for the posts from December 27th, 2018. Andhra Pradesh Public Service Commission is the state government organization that is entrusted with the duty to recruit personnel for various departments of Andhra Pradesh Government and affiliated organizations. APPSC releases various notifications round the year to recruit capable aspirants into various departments depending upon merit. Every year the APPSC will announce the official notifications for Group 1, Group 2, and Group 3 posts. Every aspirant preparing for the job of Panchayat secretary can read the entire details regarding the notification in this article. Candidates who want to apply for the APPSC Panchayat Secretary Recruitment 2018 Notification jobs can apply for it. But Applicants must possess following Eligibility Criteria to apply for the Group 3 Jobs 2018. Candidates must possess Degree from any University in India established or incorporated by or under a Central Act, State Act or Provincial Act or an Institution recognized by the University Grants Commission. Applicants of APPSC Panchayat Secretary Recruitment 2018 Notification must have the age limits as mentioned below to register for the APPSC Panchayat Secretary. No person shall be eligible for direct recruitment if he/she is less than 18 year of age and if he/she is more than 42 years of age as on 01/07/2018 as per G.O.Ms.No.132.GA (ser-A) Dept., dated: 15/10/2018. Candidates should not be born earlier than 2nd July 1976 and not later than 1st July 2000. Applicants of APPSC Panchayat Secretary Recruitment 2018 will be shortlisted for the Post of Panchayat Secretary Posts by conducting the Following Rounds. Andhra Pradesh Public Service Commission (APPSC) had announced an employment Notification to fill 1051Vacancies of Group 3 Panchayat Secretary Posts. Eligible Candidates can register for the APPSC Group 3 Recruitment 2018 through Online mode. The Application forms for Andhra Pradesh PSC Panchayat Secretary Recruitment 2018 must be submitted from 27th December 2018 to 19th January 2019. Following are the Steps to apply for the APPSC Recruitment 2018 of Group 3 Panchayat Secretary posts. On the homepage, search for APPSC Panchayat Secretary notification 2019 or you may find it in notifications page. Click on it and go through all the details properly. Now, Aspirants can fill the form online by clicking on 'APPSC Panchayat Secretary Online application form 2018' on the website. Click on it and fill the required details carefully. Check the entire application thoroughly once to avoid any mistakes. Now, click on the submit button to submit the application. The acknowledgment of the application will be sent by APPSC. Take the printout of the acknowledgment and keep it safe for further stages of the recruitment. Aspirants who had registered for the APPSC Group 3 Recruitment 2018 must pay the application fee as mentioned below. Rs 80/- (Rupees eighty only) towards examination fee.